Who wouldn’t want to spend a day at beautiful Waikiki Beach in Hawaii? 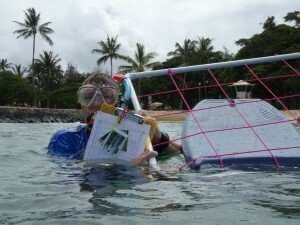 That’s where our snorkel survey for Reef Watch Waikiki begins. This volunteer opportunity is to gather data, share knowledge, promote appropriate reef etiquette and lead educational programs for both visitors and those native to the islands. In addition to the snorkel surveys in which we identified fish, coral, and invasive plant species, we also participate in frequent beach monitoring to determine human use and biological monitoring. Reef Watch Waikiki gives us the opportunity is give back to the community as well as meet an amazing group of individuals committed to protecting and inspiring others about our amazing underwater world! Lisa and Cheryl are working their way around the world. Follow us to learn how you can stretch your travel dollars!